Photo by Lars Niki/Getty Images for Academy of Motion Picture Arts and Sciences. Paranoia Man In A Rat Fink Room opened in tandem with the 13th annual New York Comedy Festival, which takes place annually during the first week of November at venues throughout New York City. As part of a special week-long preview, Caroline Hirsch, founder and owner of the New York Comedy Festival and Carolines on Broadway, curated comedic programming inside the installation, bringing to the space a functioning nightclub and entertainment venue complete with live stand-up performances. 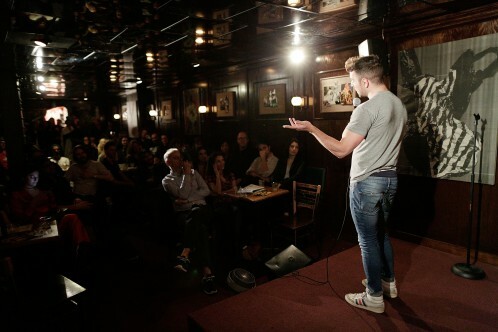 Live Preview Performances: Each night, several comedians from the NYCF performed a stand-up routine within the installation. The events started with a preview of the installation, followed at 7:30 by stand-up performances. All shows were hosted by Sara Armour. Live Podcast Recordings: Two interviews with renowned comedians were produced as part of the Industry Standard podcast series. The recordings will be available online, here. Both interviews were produced and hosted by Barry Katz. Seating at all programs were limited, and primarily by invitation. Additional RSVPs had been accepted on a first come, first served basis. For more information, contact ratfinkroom@storefrontnews.org.